This gathering of providers of all pain care disciplines, patients, medical students, caregivers, and concerned citizens were going to hear about the journey of an internationally known pain specialist. We walked not in front or behind him, but beside him, with him, as we learned about his passion for healing an America that hurts from the stigma of chronic pain. All those in attendance got a copy of his new book and as we were gathering, I noticed people were not merely leafing through their copy, THEY WERE READING IT! Stay with me and you will find out why. Dr. Webster’s message is irresistible. He tells us The Painful Truth is not a self-help book, but it is a helpful book. I am in awe of willingness to share his personal stories, his motivation for being an advocate, researcher, author, and physician with a dream to make a difference. He underscores the importance of heart, listening, and understanding that pain is more than a symptom of disease. He wants everyone across America to know the benefits and risks of opioid prescriptions, the cultural attitudes, the role caregivers take in our lives and most of all—the hope of a fulfilling life despite pain. Dr. Webster teamed up with Craig Worth to produce a documentary. Together this physician and New York and Los Angeles Emmy Award winner and former network correspondent documented important and truthful messages from patients and the many people who touch their lives in some way. The documentary itself is a testament to the spirit and determination this advocate has for people living with pain, the seriousness of not only untreated or undertreated pain and suicide, but also addiction. There is a difference between healing and curing. The message is one of hope for a better America, one with compassion for fellow human beings, an example the rest of the world can lean on. He also shares with us that his patients succumb to a primal release of emotions when he says these three words, “I believe you.” You see, he found that no matter our life’s experiences, ethnic background, age, or religious or cultural beliefs—we all share something—the need to be validated. He knows chronic pain is a thief that robs us of our self-esteem. Sadly, there is a historical—albeit irreverent—concept that people in pain are weak. Some of us are stuck in a grieving process because the healing process begins with feelings of trust and respect; something Dr. Webster admits doesn’t happen often enough. Dr. Webster is a leader in his field because of his education and experience, but mostly because he has heart and he knows how important those three words are. * The documentary will be released later this year, slightly behind its original production schedule. I wake up every morning to pain. On average, three mornings of seven begin with what I call my 4 a.m. migraine reveille. I stagger on swollen feet to where I keep my pain medicine of need. My arthritic hands fumble with the lid as I coax them into action using loving words like, come on you can do it, and sometimes—though I don’t like admitting it—expletives about the packaging. Some days that is the only trip I make to that area of my world, other days, I visit more often than I wish. But I am always grateful for the many tools that help me function. I am grateful to have a doctor willing to work with me without making me jump through a hundred hoops. He understands the unpredictability of the many pain sources I face. He understands that I have no control over the cause of my pain, but I do have control over knowing what works best for me. Many are not as fortunate as I am. I suppose pain defines who I am, but in different ways. Because of pain, I live a life interrupted. But, I am determined to live a full life, a grateful life that respects my capabilities. I have learned not to take things for granted; I appreciate the opportunity to meet the many advocates and heroes in my life. I am inspired by each, and every, person who is touched in some way by chronic pain. So you ask, “What does this have to do with The Painful Truth?” It has everything to do with it. Reading The Painful Truth reminds me that I am not on this journey alone. I now begin each day by reading this book because it provides me with the other medicine I need, inspiration—a feeding of my mind, my spirit, and my soul—a reminder of the many encounters I have had with champions, because I live with chronic pain. This is MY painful truth. Those of you who follow me on social media know that for many years my signature has been, “In healing and hope, Celeste”. The Painful Truth reminds me of the powerful message my signature line was intended to send. Healing is not the same as curing, and when we hold these words in our hands, in our mind, and in our hearts, we begin to live a satisfied life. If you are struggling to find your place, if you are still working through your grieving process (been there), read this book. Every one of us needs to hear those words, “I believe you.” Begin the healing process; it will color your world with hope. The landscape of your existence with pain will begin anew. 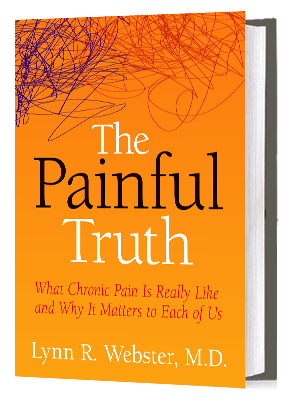 Learn more about the book on The Painful Truth book website. Also available at Barnes and Nobel.